Gas boilers burn gas to heat up water.While these systems are better for the environment than many other types of home heating options, proper ventilation is needed to remove the carbon dioxide by products from the air that can be dangerous if allowed to build up. Gas boilers for home heating are usually set up with a furnace to heat the water and a hot water storage tank to hold hot water that will be used at a later time, such as for showers. Hot water for heat will be used right away and doesn’t need to be stored. Very little, if any, electricity is needed to run a gas boiler system when it’s being used for home heating. Offering well developed and energy-saving condensing technology, the entire Logamax plus GB142 series is the best. 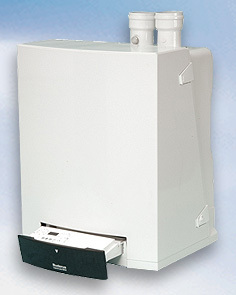 The Logamax plus GB142 can supply any type of home with heating. Up to 93.3% AFUE—ENERGY STAR® Efficient*!